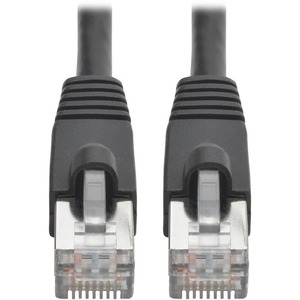 The N262-005-BK Cat6a 10G-Certified Snagless Shielded STP Network Patch Cable (RJ45 M/M) is recommended for transmitting 10 Gbps data, voice and video through high-speed 10G equipment, including network switches, modems, routers, adapters, hubs and patch panels. It also connects PoE devices, such as VoIP phones, security cameras and point-of-sale kiosks. Designed for fast transmission and excellent signal quality, this five-foot black cable ensures peak performance throughout your local area network (LAN). It reduces impedance and structural return loss compared to standard 100 MHz wire. Premium shielding protects your Ethernet network from disruptive EMI/RFI line noise that can distort or destroy data. Manufactured from 26 AWG copper wire and protected by a rugged PVC jacket, the four-pair stranded N262-005-BK minimizes near-end crosstalk (NeXT) levels. The RJ45 connectors' snagless design protects the locking tabs from being damaged or broken off during installation. Integral strain relief with ridges on each end gives the cable extra flexibility, reduces stress, and helps the cable and connectors move freely without cracking. Each N262-005-BK cable has been tested and certified using Fluke® test equipment. The test results are available upon request. It supports IEEE 802.3af, is DTE power compliant, is ETL/UL certified, and is compatible with T568A/T568B wiring.